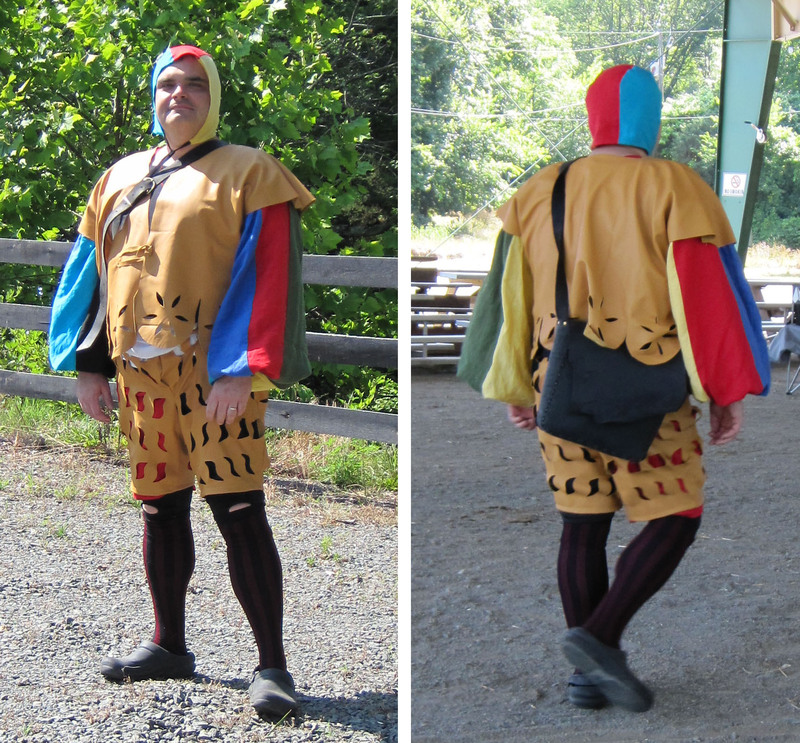 This German Landsknecht was made in about a week. The great thing about leather is that you don’t have to finish the edges! This was a pretty easy outfit to make. The leather pants, and linen under shorts, are patterned from an old pair of shorts that Basilio liked. The white linen shirt, which you can’t see, is a wide-necked hemd. The short black waffenrock under the linen vest is patterned partially after the fitted pattern that Mistress Sophia Kress helped me with. The sleeves are totally unfitted tubes of linen sewn into the armseyes. I thought that they would be huge when I made them but they still look too small when compared with period sources. The leather vest is a much modified Reconstructing History pattern. Basilio is long-waisted, so I had to add 4″ to the length to reach is waist. I also added 2″ to the back and front pieces to account for his wide shoulders. The arming cap is a complete fabrication. I have no documentation for it. He needed something to put on his head to shield him from the sun and I didn’t have time to make a proper hat. That’s on the to-do list. He said it is the most comfortable garb he’s ever worn. My only regret is that he would not wear the fitted vest properly with the left side on the outside and wrapped around to the side-seam. Since I wasn’t entering the outfit into a competition, I relented.